The union representing school support personnel is pressing LAUSD to provide the same health benefits for all its members, fearing that the district wants to create a second-class level of employees. 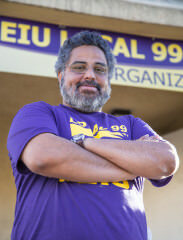 Among the 35,000 members of Service Employees International Union Local 99 (SEIU) are about 7,000 who work as teacher aides, community representatives, after-school coaches and out-of-school program workers. These employees do not have access to LA Unified’s health plan because it is either too expensive, or they are not eligible. The issue arose in June with an SEIU proposal to cover the workers; SEIU was expecting a counter-proposal. Instead, the district offered possible suggestions for the workers in the job categories in question, known as F and G units, that could include a new high-deductible plan, reduced benefits for new employees, no coverage for dependents and a cut in retirement benefits. The teachers union, UTLA, has also expressed concerns about possible cuts in health benefits by the district. The district said no decisions have been made. Bargaining team member Andrea Weathersby, who works as a teacher assistant at Purche Elementary School, said that the district was unprepared at their meeting to respond. A district spokesman said no decisions have been made that would resolve the negotiations. As one example, he cited a 70-year-old part-time worker who isn’t eligible for health care. “These are dedicated employees, and the school board needs to hear their stories so they can explain it to the public,” Arias said.